In addition to clothing items, belts, caps, etc., and burgees in various sizes, we have neckties and bow ties in either blue or burgundy with the NAS burgee, and blazer patches with the NAS burgee. 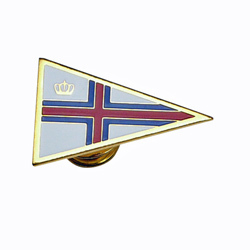 An especially popular item is the burgee lapel pin, available for $10. All NAS gear is available from Team One Newport. Order online from Team One Newport or call Team One at 1-800 VIP Gear.